Ormeau Runners are delighted to invite you all to attend and participate in its inaugural 5 Mile Trail Race on Saturday 16 March 2019. 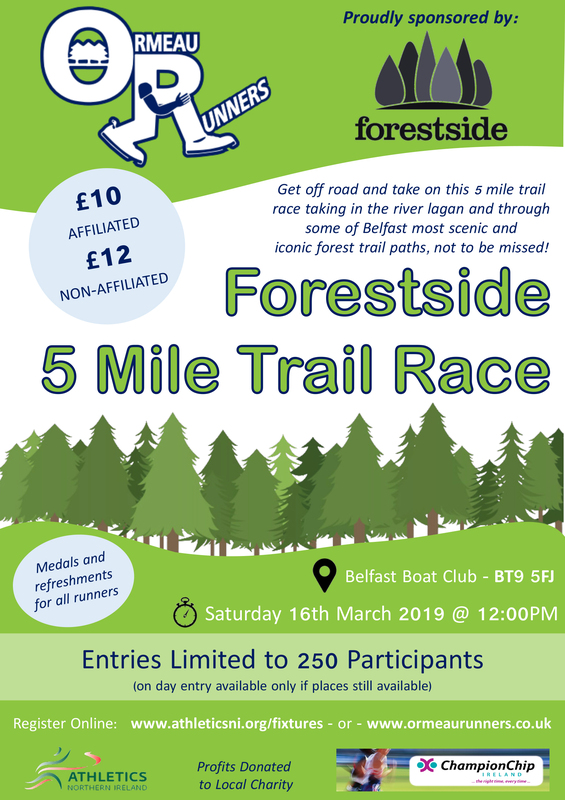 Starting at 12noon, the race will take in the trails of the Lagan Meadows before crossing the River Lagan and continuing on the Belvoir Forest trail paths, before heading back to the finish line, with post race refreshments hosted in Belfast Boat Club. Registration is online via www.athleticsni.org/fixtures or www.ormeaurunners.co.uk, with entry fee set at £10 affiliated and £12 non-affiliated. All event information is contained in the flyer below.